The Russian zone after World War II, also sometimes referred to as the Soviet zone, was substantial. The states comprising the zone included Saxony, Brandenburg, Saxony-Anhalt, Thuringia, and Mecklenburg-Vorpommern. They were close to the areas being managed by the Polish Communist government. In addition, Berlin was located within the Soviet zone, and was divided up between the four different Allied powers. This was a point of contention for a significant period of time after the war ended. One of the things that distinguishes Russian zone stamps from 1948 and 1949 is that the zone did not engage in the same type of currency reform that proceeded in the Western zones of the Allied occupation. They were forced into a currency reform due to the useless Reichsmarks that were replaced with the Deutsche Marks. This eventually escalated significant tension that resulted in the Cold War and the ongoing segregation of the Western and Eastern portions of Germany for years to come. Rare West German stamps are highly desirable for many collectors as a result. The Russian zones stamps were overprinted from the existing supplies of Allied occupation general issue stamps. They were therefore identical to the ones from 1946 and 1947, but for the overprint. There were eventually stamps issued in August of 1948 that commemorated the Leipzig Fall Fair, and contained a multiple flowers watermark. 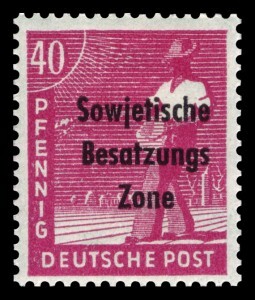 Eventually, in October of 1948, there were new Russian zone issues, containing the same watermark and depicting several notable German socialists, including August Bebel, Friedrich Engels, Ernst Thallman, and others. For more information on these valuable stamps, contact Treasure Coast Stamps. We can help you with all of your stamp collecting needs.